Ingredients: Yeast Extract, Salt, Vegetable Extract, Niacin, Thiamin, Spice Extracts (contains celery), Riboflavin, Folic Acid, Vitamin B12. 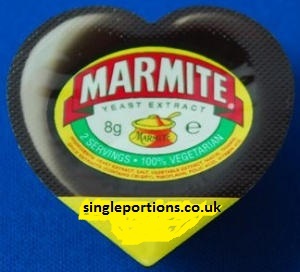 Marmite Love Portions at 8 grams nett weight each and 9 grams gross (postal) weight. To find our 'Testimonials' - look to the left side of this page.